At times, our beds are just too hot. Whether you're naturally warm or stuck in a warmer room, you may have to go the extra mile to keep things comfortable. Here are the best cooling mattress topper options currently on the market. We don't want to hit you with a list of options and leave it at that - just saying "buy this, buy this!" isn't very trustworthy. Instead, here's a little information on how we made our final selections. First, we searched for the most-reviewed and best-reviewed mattress toppers, discarding those that weren't specifically intended to help cool you down at night. Mattress toppers can be used for many different purposes, and not all of them fit the criteria for this list. Next, we looked at the materials and overall quality of the product. 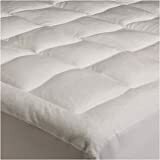 Since this is a list of the top cooling mattress toppers, we valued effectiveness the most. After that, we preferred natural materials to artificial materials, with eco-friendly manufacture as a minor consideration. For most of these toppers, we did not take price into consideration. This is a guide to the best toppers, and we had to hold true to that. However, we decided to include one budget topper at the end - while the lowest-priced toppers are never the best, sometimes that's all you can afford, and we wanted this guide to be useful for everyone. This plush top is about 1.5" deep, with an outer material made from bamboo rayon. The interior is a hypoallergenic down alternative known as RevoLoft Cluster Fiber, a 100% polyester product known for its high loft and impressive durability. This particular cover comes in all standard sizes, including the relatively rare Olympic Queen (66x80, versus the more common 60x80 for a normal Queen mattress). The airy nature of the fiber filling allows for plenty of airflow throughout the night. There is some heat retention, but the bamboo fiber used on the outside draws it away, so the pad doesn't start creating hot spots. This particular cooling mattress topper is most appropriate for back sleepers since it's not thick enough to support side sleepers. Most reviews of this product are quite positive, with a majority of people praising the softness and comfort of the pad. However, more than a few reviews cited issues with this pad falling apart when put into the washing machine. 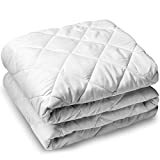 There were too many comments of that type to say it was just one or two poorly-made units, so if your mattress pads tend to get dirty, you may need another layer of protection for this pad. Our second pick is surprisingly affordable, though it only comes in Twin, Full, Queen, and King sizes - awkward if you're tall and need a longer bed. The top of this pad uses cotton terry, while the layer below has a polyurethane barrier to help repel fluids. Despite the barriers, air is still able to pass through, ensuring comfort and cooling throughout the night. The interior is a mixture of fleece and polyester, carefully distributed to ensure even cooling throughout the night. Public reviews are split on how cooling this mattress topper is, with some people saying it does an outstanding job and other citing little or no effect. Both are probably right. Mattress pads don't operate in a vacuum - factors like the room's temperature and the bed's material can affect their performance. When it works well, this topper gets the job done, but that limit is something to be aware of. Fortunately, there isn't much of a difference in price between the smallest and largest versions, though we'd have liked to see sizes that fit Twin and Full XL. Lack of support for those common bed sizes makes this product a little less helpful than it could be. This isn't the cheapest cooling mattress topper on the market, but it is one of the most comfortable and effective. It's also more durable than most of the competition, with about 50% more foam in any given part than most of the comparable products. Most people associate weight density with firmness, but that's not quite accurate. Higher density memory foam is more durable, but not necessarily firmer. At two inches thick, this topper is suitable for most normal-weight back sleepers. Heavier people and side sleepers should consider getting a 3-inch thick topper instead. Unlike normal memory foam, the gel used in these toppers helps improve cooling and airflow, making for steady cooling across your body at night. This product also comes with a 60-day no questions return policy (in case it doesn't work for you) and a 3-year warranty for manufacturing defects. That's pretty good for a mattress topper, and if you're looking to get cooler and more comfortable, this product is worth considering. The major downside is that it's only available in King size, so you may need to cut it down to fit your bed, and that would feel like a waste. It's tolerable to trim it down for a Queen, but if you have anything smaller, buy a different topper.. This interesting topper works to mix the best of both worlds. 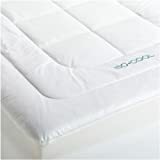 The main component is a three-inch thick pad of temperature-sensitive visco-elastic memory foam, which contours to your body and allows for a more comfortable rest. Surrounding this is a cotton protector with polyester fiberfill that permits better airflow and quick siphoning of heat. In effect, it's both memory foam and a pillow top. Unlike most toppers, however, this product isn't exclusively cooling. Instead, it's better to think of it as a temperature regulator since it can also release heat to warm you when it's colder outside. This makes it an ideal mattress topper if you're trying to get more comfortable throughout the year. Unfortunately, it's less effective if you need cooling only. Some buyers didn't realize that this topper intentionally warms at certain times and that accounts for many of the negative reviews buyers gave. Aside from those reviews, most people who bought this product like it. That's a pretty long name for a product, and we're sorry about it - but we have to name the products in their entirety to be sure you can find the one we're talking about. This memory foam topper is even denser than our previous choice, with 3.25 lbs of gel memory foam per cubic foot. 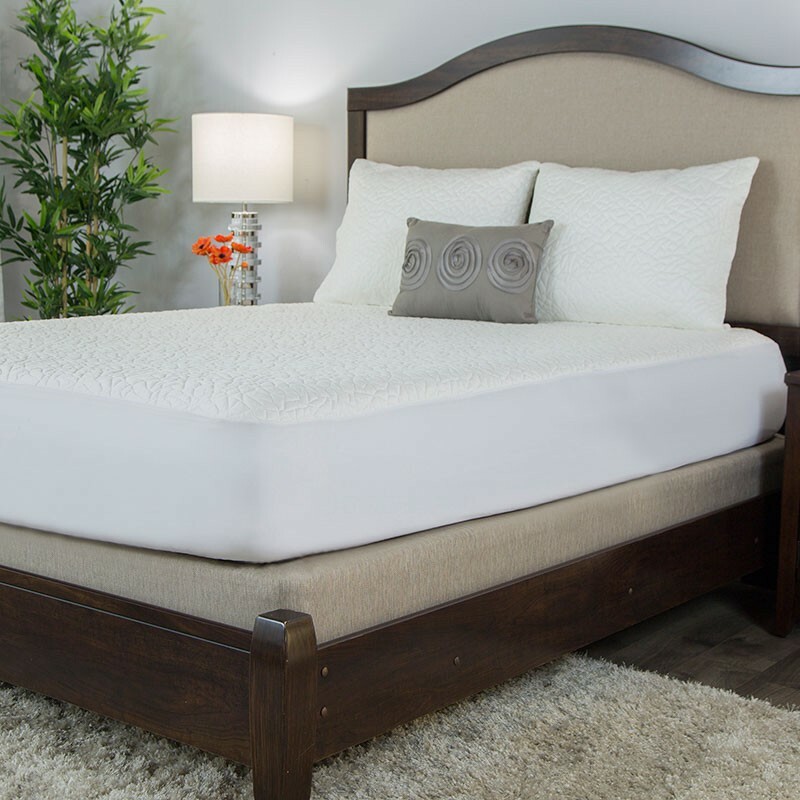 The visco-elastic manufacturing process gives this topper larger memory foam cells than most products in this category, improving airflow and maximizing cooling throughout the night. At three inches thick, it's also more suitable for side and heavy sleepers than a thinner product would be, making it a great choice for most buyers. 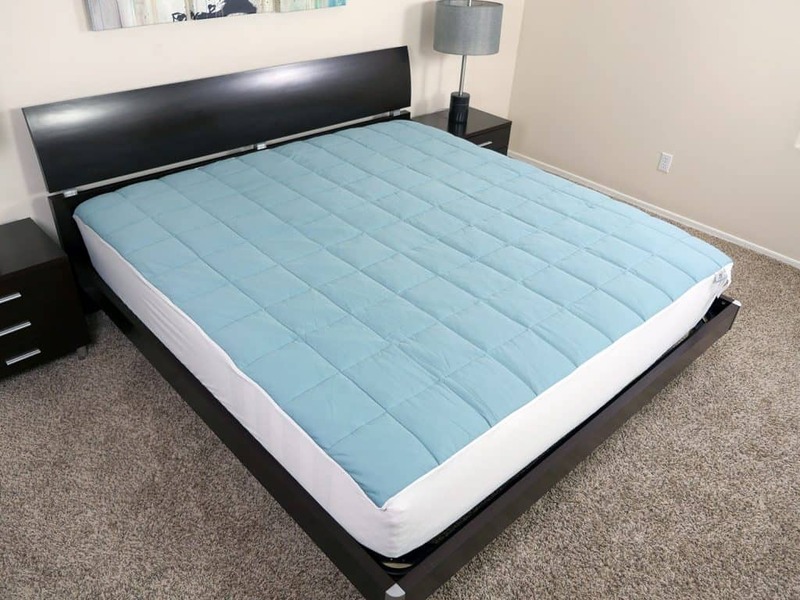 An included microfiber cover helps to protect the foam and keep it in place on top of your mattress - that's a nice touch, and we felt it helped justify the high cost of this product. This is easily one of the most affordable cooling mattress toppers - and it comes with all standard sizes, too. 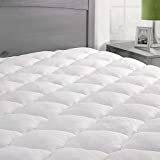 While it's not as good at cooling as the other mattress toppers on this list, it does offer a unique fiberfill with a hypoallergenic cover and resistance to dust mites. Most people who tried this product were especially fond of its softness, and indeed, some of them bought it for that very purpose. We think it's important to note that if you can save up to buy a better cooling topper, you should. Whatever your reasons for needing it are, it's best to get a product that works when you're going to spend a third of your entire life somewhere. With the amount of time we spend in bed, even a hundred-dollar difference is easy to justify if it improves your overall quality of sleep. As such, while we recommend this topper if you're on a budget, that's the only reason we'll recommend it. We'd also like to note that it's like the #4 topper in the winter - if things are too cold outside, it will help to keep you warm rather than letting you freeze. If you need cooling throughout the year, don't get this topper.